Admob has released its latest Mobile Metrics report that shows big surge in India’s Mobile Internet traffic. Infact, India reported more than twice as much growth in Internet traffic than its closest rival. 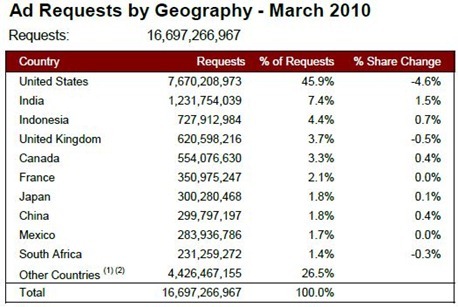 While USA showed negative growth of 4.6%, Mobile Internet requests from India grew about 1.5% in March 2010 quarter. Indonesia (0.7%) also showed decent growth followed by China (0.4%) & Canada (0.4%). In Admob’s previous report in February 2010, India was growing at 0.8%, but thanks to fabulous additions in Mobile subscribers month over month – India’s mobile internet traffic is also sky-rocketing. Nokia is still the largest Mobile handset market share holder – and that too by a large margin. It is so dominant in India that all the top 10 mobile devices used in India are all Nokia. Having said that, the Nokia Market share is falling rapidly. In last 3 months itself Nokia has lost over 4% share in Indian mobile handset markets. 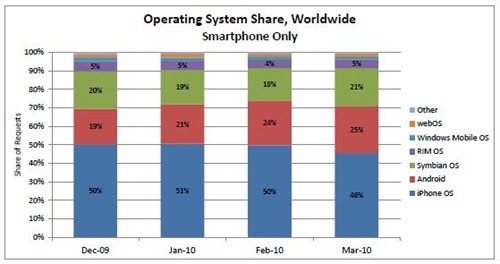 In December Nokia had 60% market share which dropped to 56% by March 2010. 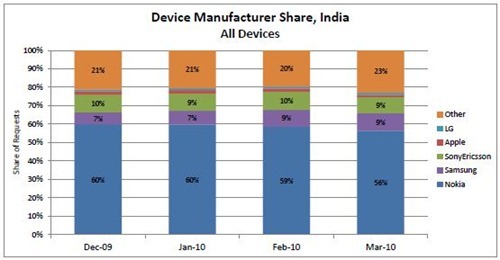 Samsung seems to be making good ground in Indian market increasing 2% market share in last 3 months. Apple iPhone rules when it comes to worldwide Mobile Internet Traffic. 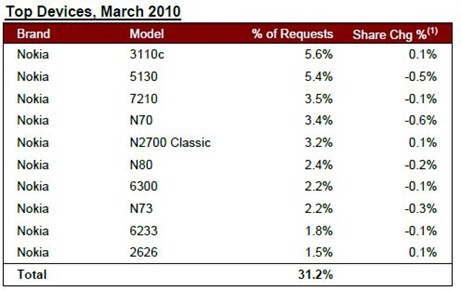 Apple iPhone OS accounted for 46% of all the mobile internet traffic requests received by Admob. While Android OS is fast catching up with the leader. It grew 6% market share over last 3 months and now commanding 25% of all mobile internet traffic. Like I have said many times before, I see Android OS reigning supreme, and surpassing Apple iPhone in next few years. WOW ! Google Maps now shows 3D imagery with Google Earth! Interesting to see these report. India adopt any technology just in a days.